The southern facing entrance to the Flex House was shaded. 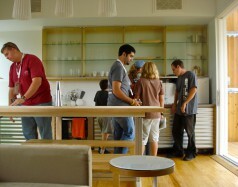 Homes ideally should be designed and built to be efficient within the climate that the home is in. 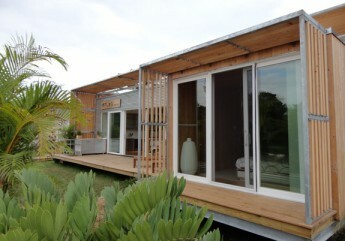 The relatively warm, sunny Florida climate fostered the design of the Flex House so that it can be passively cooled. Doors and windows were situated to allow for cross currents of air to travel across the house. 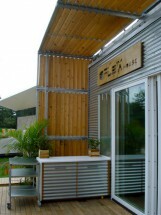 The Flex House had both a photovoltaic (PV) system to create solar electricity and a solar thermal system for hot water. The PV system consisted of 22 PV panels, each panel with its own inverter. This type of configuration in theory raises the overall efficiency of the system, as each panel’s output is not dependent upon the efficiency of the others. For example, if one panel is shaded, it should not affect the output of the other panels that are in the full sun. The solar PV and thermal systems were combined with additional energy saving mechanical heating and cooling methods to make the house even more energy efficient. 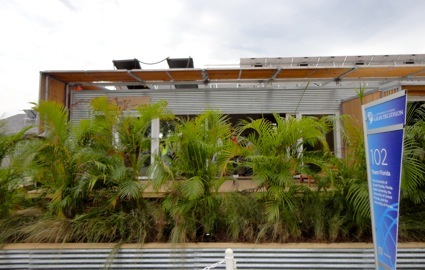 The outside of the house had an interesting armored look from the corrugated steel and the Cypress louvers that shaded the structure. 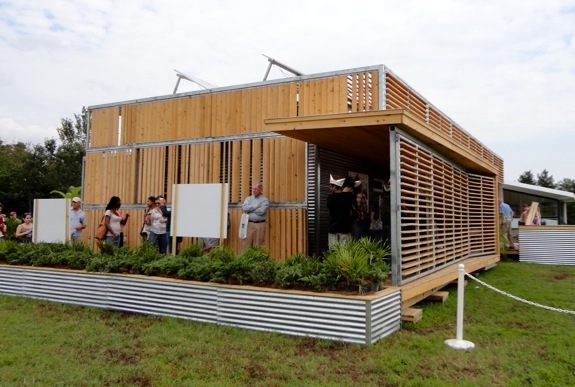 Corrugated steel is an inexpensive, yet durable siding, while the locally available Cypress shades the structure to keep the metal from getting hot. 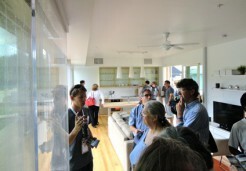 This is a passive solar concept – that materials should be leveraged to provide the desired cooling or heating effect. In their case, to keep the structure cool. Cypress is native to Florida and naturally resistant to weathering. 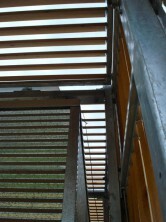 If one looked closely at the structure, however, one could notice that some of the wooden planks were warped. 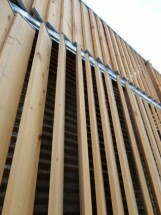 I couldn’t help but wonder what would have happened to the team’s overall score if the wood would have been heat treated in a kiln, to have a similar effect as the wood on the University of Maryland’s Watershed and University of Wellington’s Kiwi Bach house with their dark, sumptuous, straight wood. 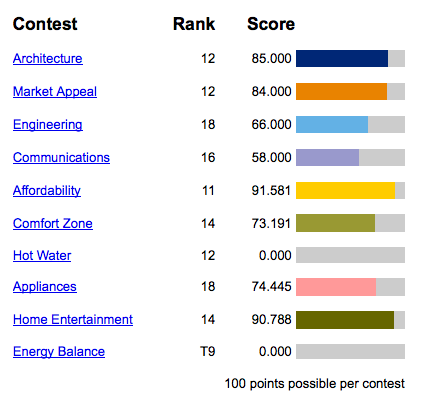 Would it have taken their score up to compare to the high scores of the competition? It’s something to think about. 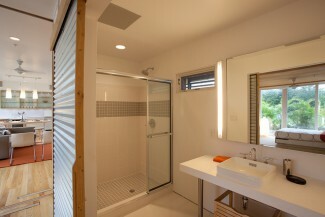 Because the home’s location is in sunny, warm Florida, the home is smartly sheltered from the sun on the south side. 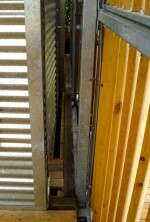 One enters the house through a shaded entry way that fostered the feeling of using a clandestine, secret passage. Yet upon entering the house, one encounters a lofty, bright, open space. 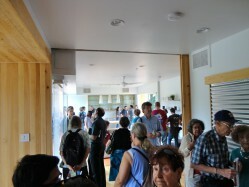 This was one of the larger feeling homes in the Solar Decathlon with a high span between the floor and ceiling. The team devised an interior desiccant air filter system that takes moisture out of the air. 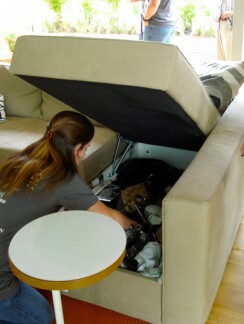 In response to their hot and humid local climate, the team devised an internal dehumidifier with a desiccant system to take moisture out of the indoor air. The transparent desiccant ‘window’ had a salt solution that attracts molecules of water. 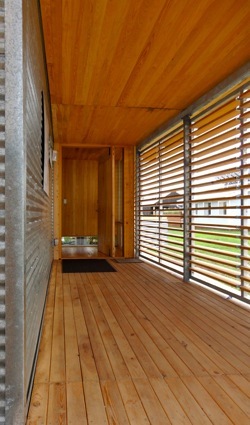 This natural attraction allows the dehumidifier to take moisture from the atmosphere of the house. This system works in conjunction with an energy recovery ventilator that both dehumidifies and depending on the season, can add or take away temperature from the incoming air. 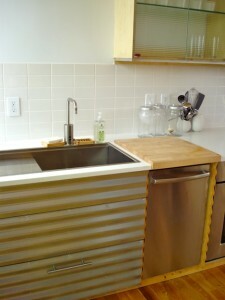 The corrugated steel was used throughout the house, including in the kitchen. Corrugated steel was also used throughout the house, creating a modern and utilitarian feel to it. 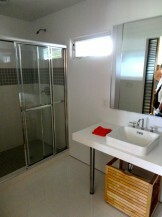 It also is a practical material that can be easily replaced. 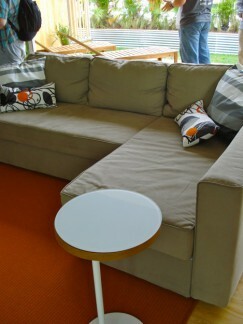 The home had ingenious space saving furniture that was on loan from a furniture company. 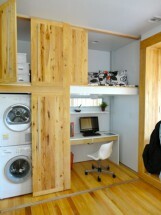 See the gallery below to see the pictures of this ingenious furniture. The team devised an interior dessicant air filter system that takes moisture out of the air. While the team gave a great effort and no doubt learned a lot, Team Florida finished in 19th place. 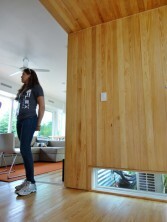 See the video below to see the open, spacious area of the Flex House. 1. Are you aware of cost-analysis for desiccant air filter system? How does this compare to other humidity control options for residential use (3000 sq ft) in SE US? What commercial systems are available and has their performance been independently assessed? 2. Has anyone tested cost/benefit of using “fresh air intake tube” that first runs underground to be pre-cooled? Here’s a link to a pdf research paper on Desiccant Air Systems. (PDF, 172 pages) Cost analysis starts on page 43.